Volleyball ankle braces help by providing added support and protection for ligaments that are often injured while playing. 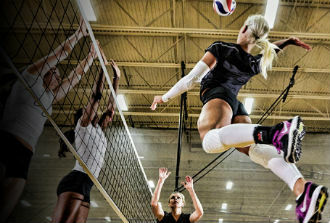 For players with previous ankle sprains, ankle braces for volleyball can prevent rollover injuries that can occur while digging, spiking, or setting. DME-Direct has a large selection of supportive ankle braces for volleyball in lace-up, wrap, and rigid styles that provide low-profile protection inside shoes. When searching our category be sure to look for more than just a specific brand or model of ankle brace A good ankle brace for volleyball offers the right blend of foot and ankle protection in a lace-up, wraparound, or a hinged design without compromising comfort. Search below or use our filter system on the left side of the page to help locate the best ankle brace for volleyball practice and games.